DVD Directed by Dean DeBlois. Since critics are legally required to refer to their music as "epic," you might expect a film about Sigur Ros, who are better at creating spacious hugeness than any other working rock (post- or otherwise) band, to be overtly grandiose itself. Two obvious predecessors, U2's Rattle and Humand Radiohead's Meeting People is Easy, come to mind: Both films chronicle bands on huge tours, riding enormous waves of critical and popular support, and ultimately coming to terms with the United States. Heima is less about the world-conquering aspirations Sigur Ros might have and more about their desire to be left alone, really. Heima is an intimate portrait not just of the band, but of the landscape of Iceland, and a study of its people. The film follows Sigur Ros(after a big world tour, unlike Radiohead and U2) ona month-long tour of their homeland, playing mostly in small towns, often outdoors, always for free. For Americans, Iceland might as well be Brigadoon or Never-Neverland — a magical place peopled by singing pixies who capture the music of the spheres and put it on magical discs that we buy for $14.99 at the record store. Eschewing Sigur Ros' critical and indie-hipster apotheosis in the U.S., Heima'sfocus on Iceland manages to both confirm and demythologize the mystical stereotype that lends the band such a fantastical air. The film's focus on nature and people is refreshing: Although the band plays gorgeous music, they're not that interesting to watch, but the landscapes of Iceland are breathtaking — what we always suspected a place that these magicians of sound come from would look like. The people, too, are so different from the rock fans you'd see at a Sigur Ros show in North America: These are grandmothers, toddlers, families, fishermen. The camera lingers on the faces of children, some watching in rapt attention, others bored and flying kites instead of listening to the band. Heima rarely shows the band playing an entire song (though the bonus disc in the double-DVD set does, which is why it stretches to over three hours). Only on the final song, "Samskeyti," at the tour's biggest show in Reykjavik, does the film show the terrifying beauty Sigur Ros is capable of, Orri P?°ll Dyrason's thundering drum beat, Birgisson's cascading bowed guitar, the ominous portent of Georg H? ?lm's bass. 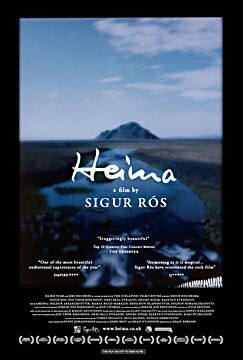 In the end, Heima goes remarkably far in showing Sigur Ros to be much less mysterious and otherworldly than hype suggests: We see glimpses of the band members as soft-spoken men, hard workers who take their craft seriously and who probably would just as soon spend a quiet night rather than play a rock show. The film, like the band, is modest, comfortable, relaxed, as its name — "home" in Icelandic — implies.